A dynamic new 'Paint London Green' campaign manifesto and film, warning the public about the dangers of air pollution to human health in our capital city, is being launched this week by journalism students at LSBU. The ‘Paint London Green’ campaign is being launched at a critical moment in national environmental awareness-raising, in the same week (Monday 8 April) that the Mayor of London launches London’s new Ultra Low Emissions Zone (ULEZ) scheme. The 'Paint London Green' campaign also follows hot on the heels of environmental protest movement, Climate Rebellion, who have recently featured centre stage in the news with their protests and publicity stunts involving students and schoolchildren, raising awareness of the perils of climate change for future generations. The film’s central narrative follows the argument that across Europe, national governments are doing very little to tackle the threat of hidden air pollution, which is strongly linked to heart attacks, strokes, premature birth, many kinds of cancer and a host of other ailments. Meanwhile, the film charts how local citizens and small businesses have been responding to the public’s growing awareness of the deadly impact of dirty air, which every year hastens the death of nearly half a million people across Europe - 40,000 in Britain and as many as 9,400 in London. 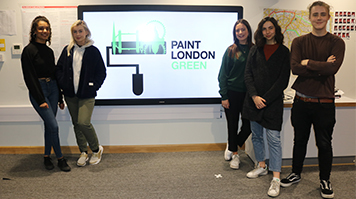 The 'Paint London Green' film was made by BA Journalism degree students in LSBU's School of Arts and the Creative Industries, including Gabrael Toner, 20, who was the cameraman and film Producer, while Aimee Gabay, 20, was project manager for the campaign. Second year BA Journalism students Hannah Crowe, 20, Jessie Dunn,19 and Lauryn Pierro, 21 also worked on the project, with Jessie in charge of overseeing social media channels and Hannah and Lauryn tasked with writing content for the website. In the film they interview a young Asthma sufferer who is struggling to live and work in London, after having moved back to the city from Guildford in Surrey, where she found it much easier to breathe and maximise her lung capacity. Also interviewed is the influential, London-based US author, campaigner and environmental journalist Beth Gardiner, who talks about her first experience of the much denser, chemical-tasting London air following the relatively pollution free air of New York. Beth takes us through the process by which the EU took the UK to the European Court of Justice in 2018, fining the UK government heavily for defying EU limits with its illegal air pollution record. Beth then brings us up to speed with the present day, discussing the introduction of the Mayor of London’s ‘Ultra Low Emissions Zone’ (ULEZ) which has come into force this week. The film-makers pay a visit to local Southwark growing project, ‘Roots and Shoots’, established in 1982 by its inspirational founder and director, Linda Phillips MBE, to ask her about the challenges of greening the urban environment through regenerating derelict inner-city brownfield sites, using tree and shrub-planting schemes. Aimee Gabay, campaign project manager, says: “'Paint London Green' is an air pollution campaign put together by myself and four other LSBU students. We collaborated with experts to compile a list of objectives that we feel will have a significant impact on the air pollution crisis facing Londoners today. We put these objectives into a petition to press the Government and policy makers to make the necessary changes and we made a short film to illustrate our campaign manifesto. Barrie Hargrove, Lambeth’s Labour Councillor for Peckham ward, who attended the film’s launch screening, said: “I am impressed. This is a very professionally put together film. It’s hard-hitting, but not too in-your-face controversial, as it tries to warn us all about the perils of air pollution in London. “I particularly enjoyed the interview with Linda Phillips from Lambeth’s pioneering growing project ‘Roots and Shoots’, talking about how she used tree-planting to start transforming a patch of derelict land in the eighties into a lush green haven of vegetation. “'Paint London Green' has a pumping, uplifting soundtrack which grabs your attention. As the film-makers have interviewed a range of people of all ages, both young and old, for their views, it should have a wide appeal". Get involved in supporting the campaign by signing the students' change.org petition. Watch a film clip from ‘Paint London Green’.